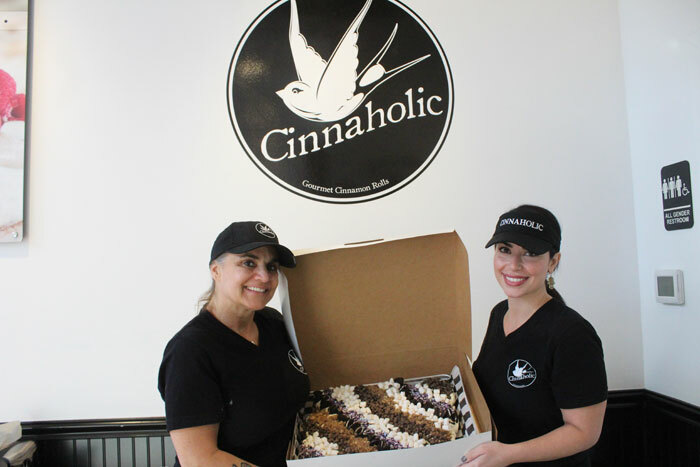 Photo by Brandon Macz: Trieva Katsandres and Maysaa Abouhamze have opened the first Cinnaholic franchise in Washington at 816 E. Pike St., in Capitol Hill. Trieva Katsandres makes a vegan cinnamon roll. There are a number of cinnamon roll creations people can choose from if they are having trouble customizing their own. Cinnamon rolls are a sweet treat mostly associated with breakfast. The fully customizable spirals coming out of Cinnaholic in Capitol Hill have late-night fans too. “And everybody takes pictures of their rolls,” said Maysaa Abouhamze. Abouhamze and Trieva Katsandres opened the first Cinnaholic plant-based bakery franchise in Washington, at the corner of Broadway and East Pike Street, in late October. “Vegan food doesn’t have to be bland or boring or taste healthy,” said Katsandres, who is vegan. Longtime professional aestheticians, the duo also run two Trieva’s Spas in the Seattle area; they gave out massages and facials on Cinnaholic’s opening day. Cinnaholic was founded in Berkeley, California in 2009, and now has 29 locations. Customers can choose among a variety of frosting flavors, and then as many toppings as they want. Abouhamze said people usually go with one flavor of frosting, which is created using a variety of oils, sunflower and soy lecithin, and beet sugar. There is also a case full of staff creations — yes, there’s one for Seahawks fans —people can choose from. 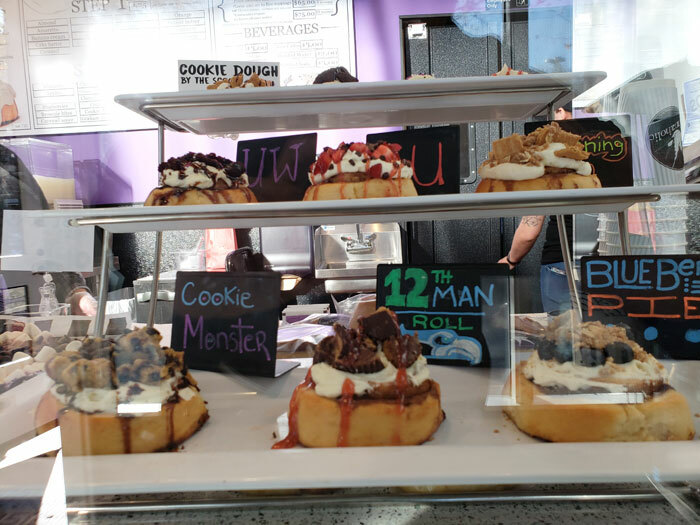 The business partners had been looking for a franchise to invest in, many much larger than Cinnaholic, they said, but felt the company was more accommodating for a small-business concept. “As we got to know other franchises, this one was actually really supportive of its franchisees,” Abouhamze said. They received franchise training in Atlanta, and then Cinnaholic representatives came to Capitol Hill to train Katsandres and Abouhamze’s staff. Katsandres said they looked for space in a number of neighborhoods, but really wanted to be in Capitol Hill. The former M Room barbershop was available at 816 E. Pike St., and they even saved the old Broadway sidewalk they discovered when pulling up the floor, Katsandres said. “This neighborhood is extremely welcoming, and everyone is really cool,” Abouhamze said. And the Cinnaholic franchisees are signed up to open two more locations. “Now, it’s deciding where those are going to be,” Katsandres said. The business owners said they pride themselves on being local women entrepreneurs, and also being moms. 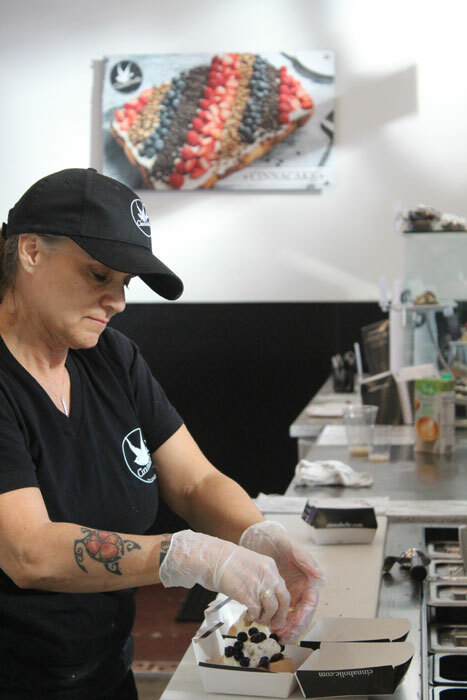 Abouhamze said she cares about what her kids eat, and Cinnaholic’s vegan baked goods make her feel better when they come in to check the product. Abouhamze and Katsandres said they’re busiest on Friday and Saturday nights, and they’re hoping to grow the catering side of the business. They also have a Cinnacake that works well for parties; it comes with five toppings and an option of six, eight or 12 rolls. Find out more at cinnaholic.com.